TALLAHASSEE, Fla. – Given the ball, 2:53 on the clock and the weight of a 36-year bowl streak on his shoulders, Deondre Francois looked to a pair of future Hall-of-Famers for inspiration. The answer, it seems, is to throw it deep to the 6-foot-4 receiver. With Francois channeling his inner Brady and Tamorrion Terry playing the part of Randy Moss, Florida State’s offense struck for a devastating, 74-yard touchdown pass down the middle of the field that lifted the Seminoles to a 22-21 victory over No. 22 Boston College at Doak Campbell Stadium. As a result, Florida State improved to 5-6, snapped a three-game losing streak and gave itself a chance to extend its NCAA-record bowl streak to a 37th consecutive season. All the Seminoles have to do is beat rival Florida, 8-3 and ranked 15th, for a sixth straight year next week at home. “An incredible win for our guys,” FSU coach Willie Taggart said after leading the Seminoles to their first victory over a ranked opponent since the 2016 Orange Bowl. Francois’ only touchdown of the night sealed a game that hung in the balance just moments before. On the strength of a plodding running game and an offense that converted 7 of 19 third downs, the Eagles led for most of the afternoon, and held both the ball and a five-point advantage as time wound down on the fourth quarter. 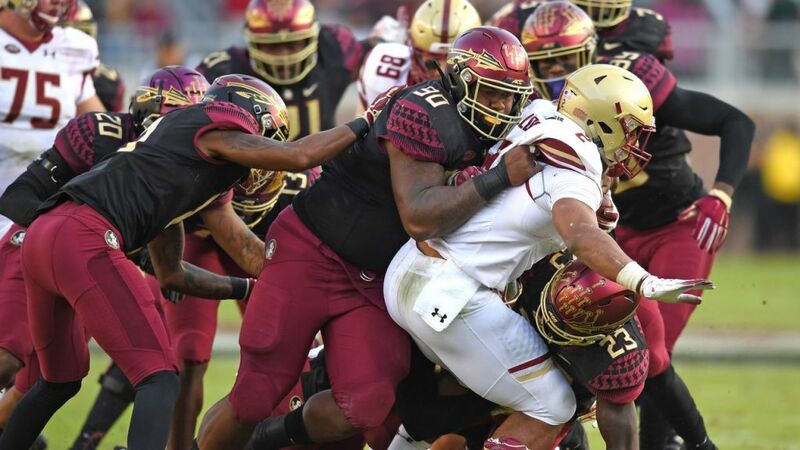 But faced with a fourth-and-1 at Florida State’s 40-yard line, BC coach Steve Addazio left 6-foot, 245-pound running back AJ Dillon on the sideline and opted to punt. The Eagles had already converted three of five fourth-down attempts, and, had they picked up one more, might have all but sealed the game. Instead, BC gave the Seminoles the opening they needed. Three plays later, following an eight-yard run from Cam Akers and a five-yard quarterback keeper, Francois went deep to Terry, who was one-on-one with a 6-foot-1 cornerback. As he has all season, Terry made it look easy. He raced past his defender, caught the ball in stride then stepped over a weak tackle attempt before racing into the end zone. And when he crossed the goal line, Doak Campbell Stadium roared as loud as it had in months. Who would argue? Eight of Terry’s 32 catches this season have gone for touchdowns, including scores of 78, 74, 55 and 35 yards. He already owns FSU’s record for freshman receiving yards, and with one more score he’ll tie Greg Carr for the school’s all-time mark in freshman receiving touchdowns. Asked after the game about his decision to punt, BC’s Addazio said that he regretted the outcome but not the choice. Francois finished with 322 yards, a touchdown and a pair of interceptions while freshman Keyshawn Helton, making his first start, caught a team-high six passes for 72 yards. And running back Cam Akers continued his recent upward trend with a 14-carry, 110-yard night that put him over the 100-yard mark for the first time this season. That includes a 55-yard scamper in the fourth quarter in which Akers broke a tackle, lost his balance and nearly went to the ground before steadying himself and making his way to the left sideline. That play led to a 37-yard Ricky Aguayo field goal – one of three – that kept the Seminoles within striking distance. Florida State’s defense, meanwhile, did a more than admirable job in slowing BC’s Dillon. Yes, Dillon had 116 yards and two touchdowns. But it took him a season-high 37 carries to get there. And seemingly every time Dillon touched the ball, there was an FSU defender – or two, or three or sometimes four – ready to meet him. “That was the first time I saw our defense fly around to the ball,” Taggart said. “It wasn’t just one guy hitting him. It was two, three, four guys flying to the ball. Two other things that define Florida State football? Playing in bowl games and, more recently, beating the Florida Gators. The Seminoles have played in the postseason in every year since 1981. And they’ve won every game against Florida since 2012. Perhaps it’s only appropriate, then, that doing the latter next week will ensure that the Seminoles do the former later this year.